Allari, Anasuya and Avunu shot fame Director Ravi Babu is now coming up with creative storyline for this forthcoming film titled Adigo and it is ongoing with its post production works. Adigo and the film is touted to be an commercial thriller in offering. 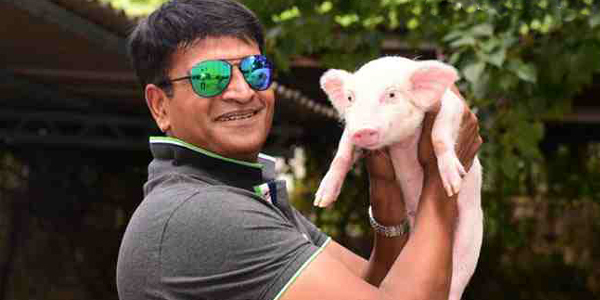 Ravi Babu has said that he is working on the script since a year and for which he designed a silicon model piglet and shot few scenes with it. But all of a sudden it has broken and made him to picturize rest of the sequences with real piglet. The shoot has began in March and completed in just 3 months. Adigo uses animatronics with live action visual effects to create the needed scenes for the film. Apart from piglet, this film also features Naab and Abhishek in lead characters.